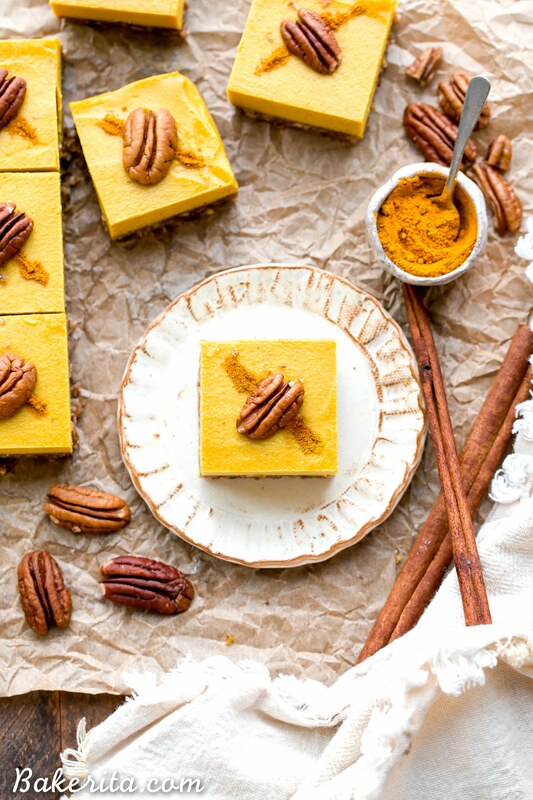 These No Bake Golden Milk Cheesecake Bars are loaded with the anti-inflammatory benefits of turmeric and the warmth and comfort of golden milk. 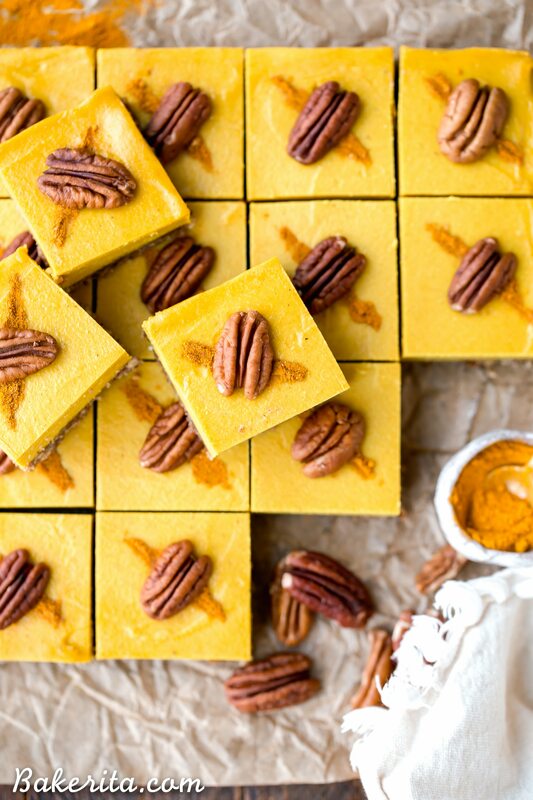 They’re deliciously spiced, gluten-free, paleo, vegan, and perfect for sharing. Thanks to Sunfood for sponsoring this post! Are you a golden milk latte fan? I certainly am – the spiced, beautifully colored turmeric-based drink warms my soul. It’s the perfect pre-bedtime drink. I tend to be relatively lazy with my nighttime drinks and don’t want to spend too long measuring and blending powders to create the perfect elixir the way I do in the morning with my mushroom coffee. I’d rather have them all combined for me, so I can measure once, mix with my warmed nut milk, and be onto my sipping. Thankfully, Sunfood has done the legwork for us, creating the perfect balanced blend to create a delightful latte. Just a teaspoon of their Golden Milk Super Blend makes a gorgeous, anti-inflammatory drink that tastes amazing. Sunfood makes their Golden Milk Super Blend with all the things I use in my own golden milk mixture. This is including the turmeric root, which is the base of golden lattes and the anti-inflammatory powerhouse of the group. Black pepper, which is necessary anywhere turmeric is used because it activates the curcumin: the powerful anti-inflammatory compound in turmeric. Ginger root, which helps support digestion. Maca root, which is good for energy and hormone balance. Goji berry, for immune support. Boswellia, for joint and mobility support. Cinnamon, for flavor and antioxidants. Cardamom, for detoxification, and stevia for a little sugar-free sweetness. ALL of these ingredients are organic. About the stevia, I usually do not like stevia. I am very sensitive to its flavor, but I don’t notice it being overt or too sweet in this mix. After a few warm golden milk lattes, I knew I wanted to translate that flavor into a sweet treat. We want the warmth of the spices and that beautiful golden color would come through. 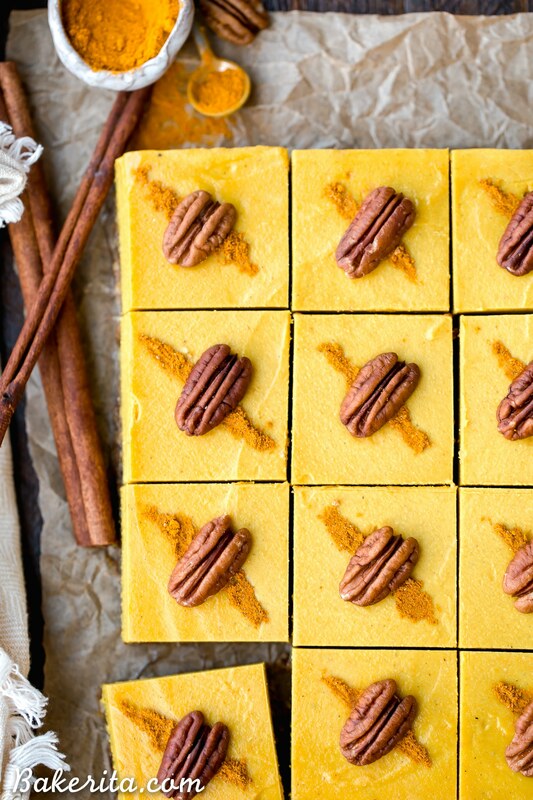 Enter: No Bake Golden Milk Cheesecake Bars. 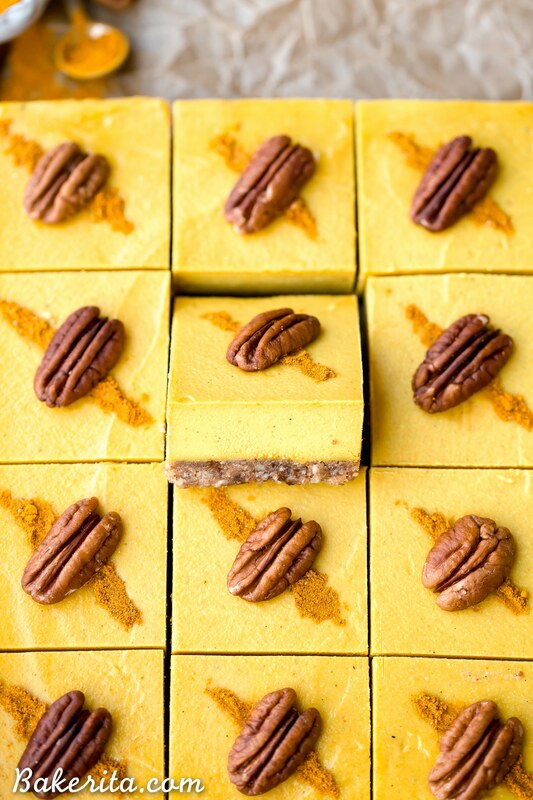 Golden Milk, meet Vegan Cheesecake Bars. 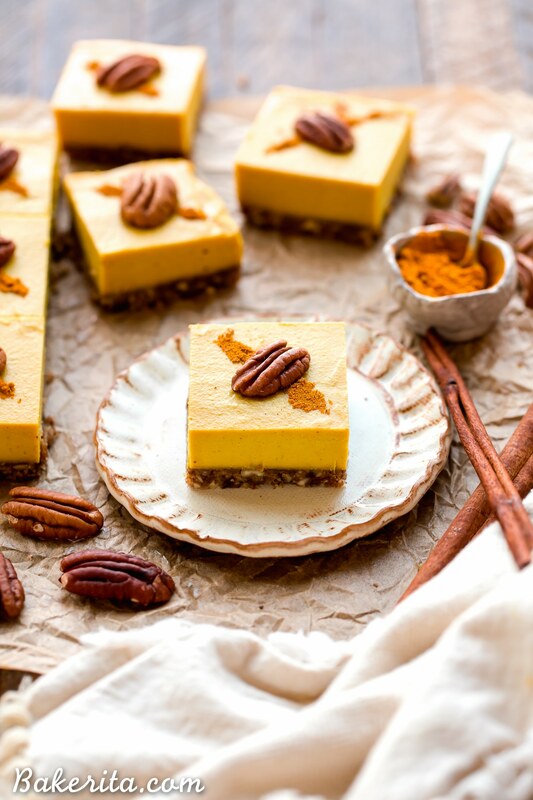 I’m a huge fan of no-bake vegan cheesecakes and cheesecake bars, and adding some of the golden milk blend to my go-to cheesecake base recipe was a resounding success. It took on the most stunning color and an even more beautiful flavor. So well spiced, with all of the flavors of golden milk coming through in the most creamy form. I paired that with a pecan crust (also no bake) for a dessert that is sure to impress. It will also help support your body through all of the superfoods. Just don’t drop it on your white couch or shirt (not that I’d know why…). I hope that you’re a soon-to-be golden milk convert if you’re not already a big fan. If you are, then you know you’ve got to try this creamy iteration of it! Hope you love it, my beautiful friends. Be sure to let me know if you give them a try by leaving a comment below and/or tagging me on Instagram (@bakeritablog) if you decide to share there. xoxoxo! 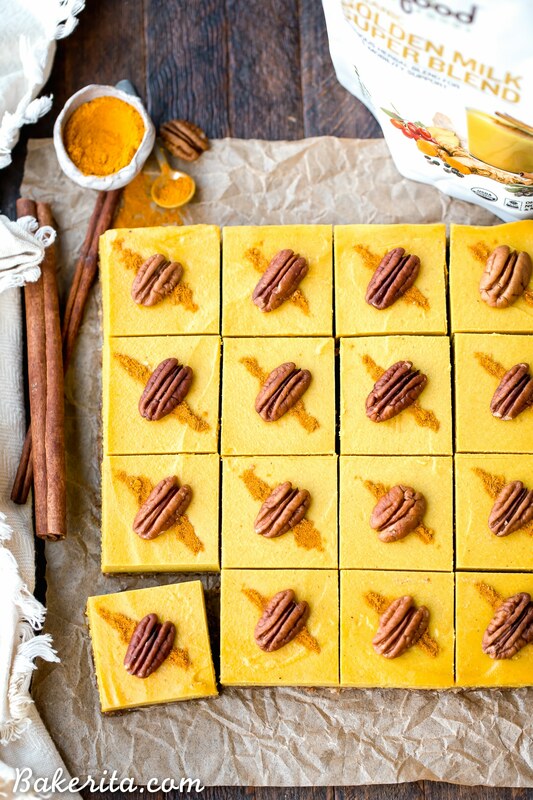 These No Bake Golden Milk Cheesecake Bars are a dessert that's loaded with the anti-inflammatory benefits of turmeric and the warmth and comfort of golden milk. They're deliciously spiced, beautifully colored, and perfect for sharing. Line an 8” square pan with parchment paper for easy removal and lightly grease with coconut oil. Set aside. Add the pecans, pitted dates, coconut butter, and salt to a food processor or high-powered blender and pulverize until it comes together into a sort of sticky dough, with small pecan bits remaining. Press the pecan date dough evenly along the bottom of the prepared pan. In a high-powered blender (I used my Vitamix, but most powerful blenders should do the job), combine all of the ingredients for the filling and blend for about 2 minutes, or until the mixture is silky smooth and creamy. You may need to add a bit more coconut milk or lemon juice to get it to blend smoothly if your blender isn’t super high-powered. Pour the smooth filling into the prepared pan over the pecan crust. Smooth out the top and tap the pan hard against the counter a few times to release any air bubbles. Place in the refrigerator or freezer to set for at least 3 hours or until completely firm before cutting into 16 squares. If they’ve been frozen, I recommend running your knife under hot water to warm it up before cutting the bars with the still-hot (dried) knife. Serve straight from the fridge, or if frozen, let them thaw at room temperature for 10-15 minutes before serving. Store in an airtight container in the refrigerator for up to a week, or in the freezer for up to 2 months. OMG these look incredible!! I am going to the store in the mmorning to get what I need to make these! Every single thing of yours I have made has been amazing, and I know these will be too! Thank you so much for always posting such creative and tasty recipes!! Hi. Recipe looks great! I am from Holland. What can I use if I cannot get the golden milk blend? Hi Bhavnita, you can use any golden milk blend if you can find any near you, or use a combo of turmeric, ginger, cinnamon, cardamom, and black pepper to replicate it! I couldn’t resist this recipe and I had all of the ingredients on hand. It turned out fabulously! Yummy to the gluten free tummy! It was a big hit with my family. Thank you. Grateful I found you too! So thrilled you’re enjoying them Geege! Thanks so much for the feedback.